Organizations such as the American Legion do a lot of good for their own community and the larger community as well. None of that would be possible were it not for the membership, the feet on the ground and those who take on leadership roles in such organizations. Together, they are the ones who make those good things happen. A perpetual membership board is a great way to honor those who who take the time and make the commitment to serve and to encourage new membership. 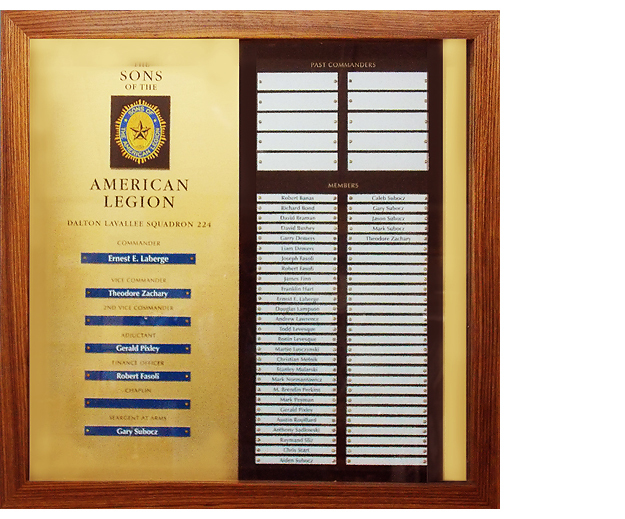 Displays such as this one for the Sons of the American Legion in Easthampton, Massachusetts are designed so that as new members sign on and other members leave, the display can be easily updated to reflect the current status. This display is presented inside a shallow cabinet so that once it has been mounted to the wall, the glass door allows access to the tags. The background gold is made of aluminum with a gold finish that can be sublimated. 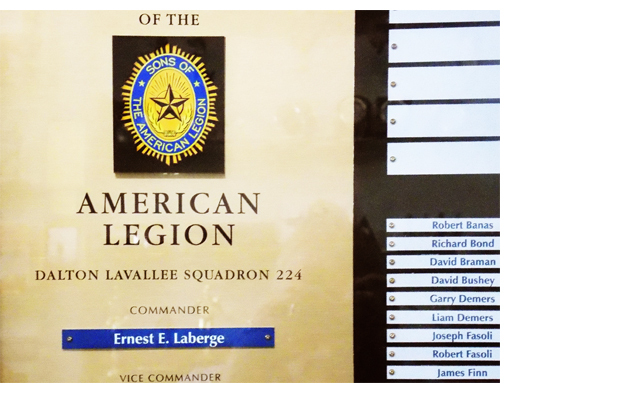 All of the black copy, above and below and including the words American Legion, were sublimated onto this gold panel. The logo was also sublimated in full color on acrylic and laser cut along the outer edges of the gold rays. That piece was then inserted into a duplicate laser cut opening in the black 1/4 inch thick panel behind the logo. All of the individual names were laser engraved onto matte laminated acrylic and individually laser cut to form the long narrow rectangles. The mounting holes were also laser cut at the same time. The blue tags on the gold panel, laser to white lettering while the white tags on the black panel, laser to blue lettering. The headings on the black panel, also an acrylic laminate, laser to gold. All of the tags were mounted with tiny screws allowing them to be removed and replaced as needed. 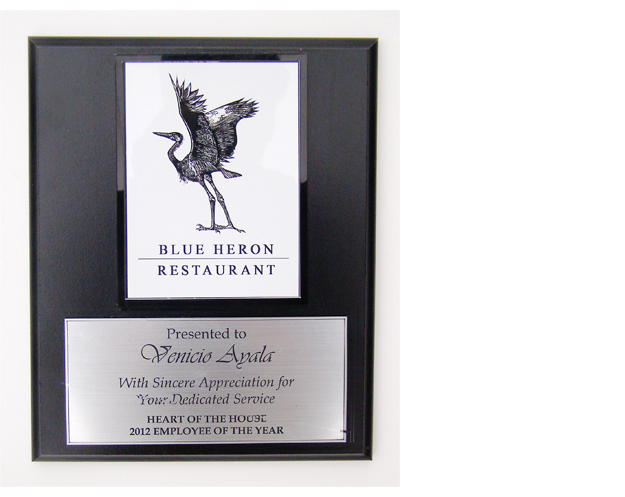 This entry was posted in Custom awards, Fabrication, Laser engraving, Personalization, Sublimation on November 22, 2013 by cawards.